Saraswati (सरस्वती) is the Hindu goddess of knowledge, music, arts, wisdom, and learning worshipped throughout Nepal and India. She is a part of the trinity (Tridevi) of Saraswati, Lakshmi and Parvati. All the three forms help the trinity of Brahma, Vishnu and Shiva to create, maintain and regenerate-recycle the Universe respectively. Some Hindus celebrate the festival of Vasant Panchami (the fifth day of spring) in her honour, and mark the day by helping young children learn how to write alphabets on that day. The Goddess is also revered by believers of the Jain religion of west and central India,as well as some Buddhist sects. Saraswati is also worshiped outside of South Asia, in regions such as Japan, Vietnam, Indonesia, and Myanmar. In the Rigveda, Saraswati is a river as well as its personification as a goddess. In the post-Vedic age, she began to lose her status as a river goddess and became increasingly associated with literature, arts, music, etc. In Hinduism, Saraswati represents intelligence, consciousness, cosmic knowledge, creativity, education, enlightenment, music, the arts, and power. Hindus worship her not only for “secular knowledge”, but for “divine knowledge” essential to achieve moksha. In some Puranas (like Skanda Purana) she is sister of Shiva (Shivaanujaa) and in some Tantras with Ganesha. and which is known in the Smriti-sastra [Scriptures of Remembrance] as the yoga-pitha [Sanctuary of Union]. (Padma Purana Uttara-khanda). Accompanied by Goddess Lakshmi and other associates, the chatur-vyuha (Four Expansions) headed by Lord Vasudeva are manifest in the eight directions, beginning with the east. In the directions beginning with the southeast, the palaces of Lakshmi, Saraswati, Rati, and Kanti respectively are situated. Saraswati's name means 'elegant', 'flowing', and 'watery' and this is indicative of her status as one of the early Aryan boundary rivers. The Saraswati River, just like the Ganges River, flows from the Himalaya and is considered a sacred source of purification, fertility, and good fortune for those who bathe in her waters. The sacred river, again like the Ganges, then developed into a personified deity. The goddess has her own festivals, notably the Saraswati Puja, held on the first day of spring. During the festival, worshippers wear yellow, which is associated with wisdom and prosperity. Statues of the goddess are also draped in yellow silk, and believers pray for blessings on their pens, books, and musical instruments. Children are taught to write for the first time during the festival, Brahmin priests are given fine food, and ancestors are venerated. Saraswati is also worshipped along with other major goddesses in the pan-Indian celebration of Navaratri. As the patron of music, she is frequently prayed to by musicians before concerts and, as a goddess of intellectual pursuits, by students before examinations. In Hindu art, Saraswati is usually depicted as a graceful youth with white skin. She most often wears a white sari (which symbolises purity) which has a blue border. Not being concerned with worldly goods she rarely wears jewellery. She may have a crescent on her forehead and be seated on a lotus flower. Alternatively, she may be shown riding her vehicle (vahana), either a swan or goose. Frequently represented in figure sculpture on temples, the goddess may be accompanied by either her husband or a peacock, her traditional assistant. As with many Hindu deities, Saraswati is often depicted with four arms, each holding a symbolic object. In the left hands she can carry a palm-leaf manuscript and ritual water vessel. In the upper right hand she holds a white lotus flower while the lower right hand typically performs the varada mudra, the traditional gift-giving gesture of Hinduism. 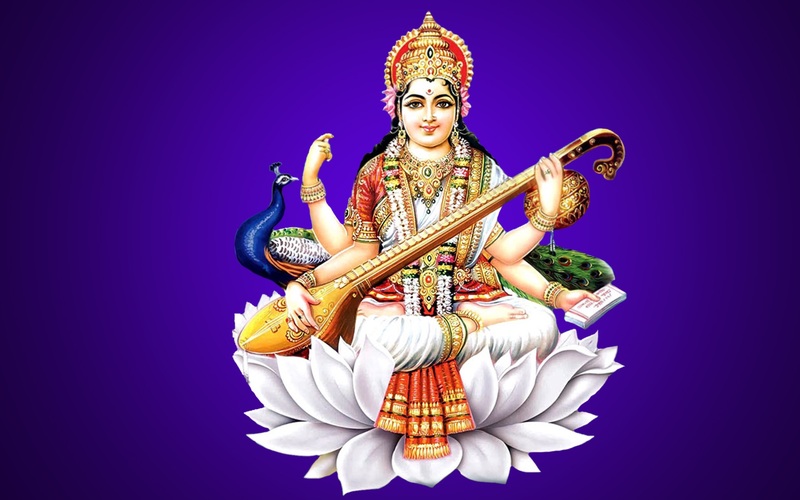 Another object commonly seen in Saraswati's hands is the vina (the Hindu classical music instrument) which reminds of her gift of music to humanity.